This spring’s edition of Bates Night in Town, an occasional event that encourages Bates students to go out and taste Lewiston and Auburn’s offerings, was a big hit on May 7. Students, faculty, staff and community members flocked to eateries and student performances on both sides of the river, enjoying not just the amenities but the laughter and friendship that thrive during Short Term. The event was organized by Bates students in conjunction with L-A businesses and the Androscoggin County Chamber of Commerce. Among the restaurants offering discounts to Bates students, She Doesn’t Like Guthries was a popular stop. 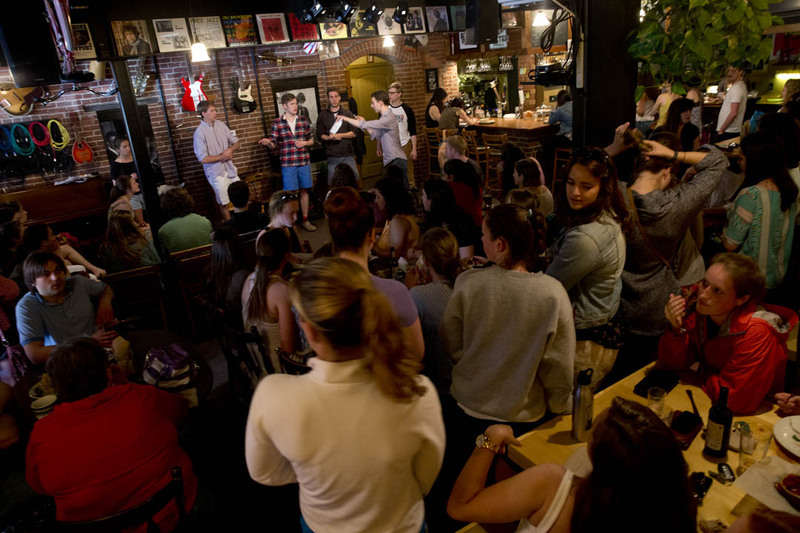 Known for tasty burritos and sandwiches, the joint teemed with students appreciating the witty performances of the Strange Bedfellows, a Bates improv group. The Guthries crowd was mostly Bates students. The walls in the dimly lit restaurant were decorated with mosaic artworks for sale, and a hanging bike and album covers of the Beatles and Bob Marley lent a retro feel. A few blocks away at another participating restaurant, the upscale Fuel, owner Eric Agren praised Bates Night in Town as a “focused opportunity for students to come out as groups.” The event provided restaurateurs with a valuable marketing opportunity, said Agren, who added that he’s a fan of Bates’ own dining Commons. 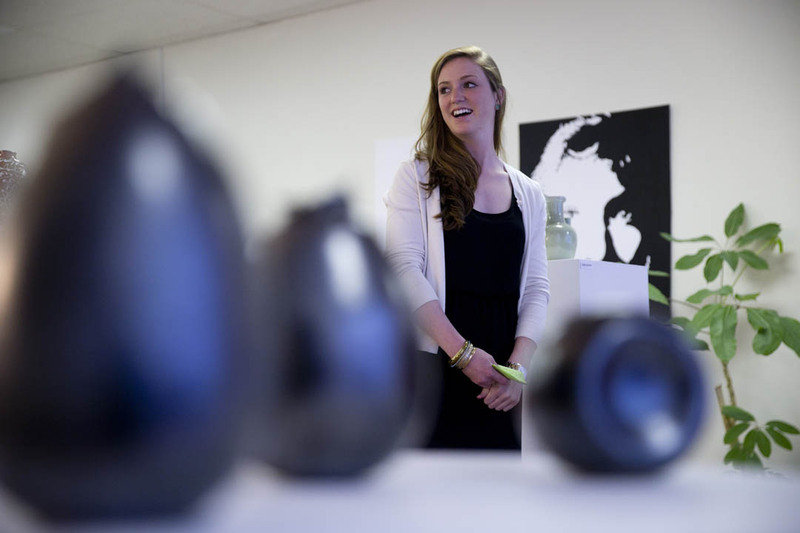 Caroline O’Sullivan ’14, lead organizer of Bates Night in Town, monitored the spaces displaying student artworks. “We wanted to use different mediums such as art to help students connect with members of the community,” she said. Bates Night in Town is a great motivator for students who are interested in getting off campus but normally don’t do so. The eating, music making and strolling through the Twin Cities culminated in an a cappella and dance extravaganza at Auburn’s Festival Plaza, overlooking the Androscoggin River. 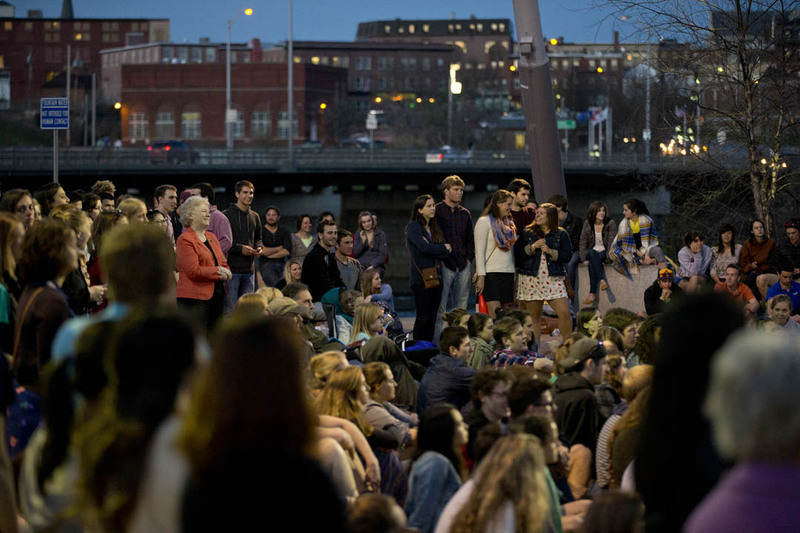 Students from Bates and other local schools congregated with community members at the Plaza, some bearing treats from the nearby Top It Frozen Yogurt Bar. As the Bates Dance Club performance unfolded, the crowd cheered and captured it on their smartphones. A collaboration between the Merimanders and the Manic Optimists on the Destiny’s Child hit “Survivor” was widely cheered for its energetic, funny moves and lovely singing. In the crowd was an enthusiastic Bates President Clayton Spencer.